I have a story up at Hobart, a fabulous online journal. It’s very short and once again (or, perhaps, "as usual"), rather sad. And there was also a lot of math involved in the writing of it—which I did all by myself, and which is as accurate as humanly possible. Thanksgiving Week Focus on Food: Hushpuppies! ...Now I’m not about to define “hushpuppy” in some partisan and proprietary way, though it is kissing cousin to a fritter, neighbor to cornbread and a far cry from a crepe. I’m not even going to dictate how to concoct the ideal knee-knocking, unforgettable, whiplashing-scrumptious hushpuppy, other than to recommend some basic components and say that you’ve got to tickle the oil right up to about 400 degrees, which is also the temperature the mercury will register if you stick a thermometer under the tongue of most anyone in my family when their ire is aroused. Our tribe’s tendency to run hot and express our displeasure in unruly and emphatic fashion should right away clarify a couple of things: the oral method is the only fever measurement method worth trying on us, and don’t stand between us and anything we prize or favor, especially our preferred provender. But don’t get me wrong here; we are neither rabid nor deranged, only enthusiastic. 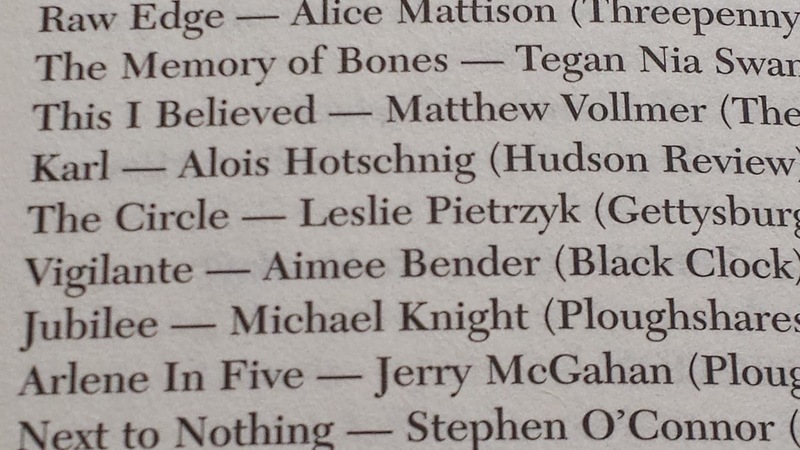 In the writing world, we celebrate when we can, so while my work didn’t win a Pushcart Prize this year, my story “The Circle” was given a special mention in the list in the back as an “important work” published during the year. Yay for bridesmaids!! And yay for The Gettysburg Review, the journal where it first appeared, and yay for writer Mark Wisniewski who nominated the story. And yay for everyone in the Pushcart organization who must work SO HARD to compile this 655 page book, which you should read and support. And yay for VCCA (Virginia Center for Creative Arts) where I drafted this story. --please, PLEASE send the request to my personal email address, lesliepietrzyk@gmail.com If you subscribe to the blog feed and “reply,” that goes to a different email address, one loaded up with neighborhood listserve notices and emails about sales at Ann Taylor and restaurant menu changes etc. and your email will get lost if I don’t answer immediately, which I probably won’t be able to. Also, trust me when I say you don’t want that email in your computer as “my” email address. "How to Transition from Introverted Writer to Marketing Maniac"
"You wrote. You edited. You rewrote. You submitted your manuscript. Finally, the acceptance letter arrived. You celebrated. You high-fived. You fist-bumped. Then, reality hit. You now must promote your work. Before you retreat under your bed in terror, before you have an anxiety attack over the awkwardness of writing and talking about yourself in third person, check out these 20 steps for easing your transition from introverted writer to marketing maniac...."
Apply for the FREE Jenny McKean Moore Community Workshop at GWU! Come and take part in a semester-long creative nonfiction workshop! To apply, you do not need academic qualifications or publications. The class will include some readings of published writings (primarily memoir and the personal essay), but will mainly be a roundtable critique of work submitted by class members. There are no fees to participate in the class, but you will be responsible for making enough copies of your stories for all fifteen participants. Students at Consortium schools (including GWU) are not eligible. To apply, please submit a brief letter of interest and a sample of your writing, 12 pt type, double spaced, and no more than 7 pages in length. Make sure you include your name, address, home and work telephone numbers, and email address for notification. Application materials will not be returned, but will be recycled once the selection process is completed. Applications must be received at the following address by close of business on Monday, 5 January 2015. All applicants will be notified by email of the outcome of their submissions no later than Saturday, 27 January 2015. Brando Skyhorse is the 2014-15 Jenny McKean Moore Writer-In-Washington at George Washington University. He is the author of Take This Man: A Memoir, and a novel, The Madonnas of Echo Park, which received the 2011 PEN/Hemingway Award and the Sue Kaufman Award for First Fiction from the American Academy of Arts and Letters. He has been awarded fellowships at Ucross and Can Serrat, Spain. Skyhorse is a graduate of Stanford University and the MFA Writers’ Workshop program at UC Irvine. I’m looking forward to this event in New York City, where I’ll be reading at the legendary KGB Bar as part of the Literal Latte celebration. Come join us or send your friends/family (though, I should note that I'll be reading for all of FOUR minutes...but what a four minutes it will be!). Literal Latte 20th Anniversary Celebration! Come join our celebration of two decades of great stories and poetry! There will be booze, and there will be words…. Before 1994, New York City, the “publishing capital,” lacked a community literary paper featuring mind-stimulating stories, essays and poems for consumption by New York editors, agents, writers and readers. Literal Latté filled the void — debuting in June 1994 and offering 30,000 free copies of its literary brew in New York’s coffeehouses, bookstores and arts organizations. Reaching ten times as many readers as traditional literary magazines, Literal Latté caffeinated careers, bringing writers from around the world into the offices, homes and hands of New York’s publishing professionals, writers and readers. The founders knew that great writing, in a friendly and easily available format, would be as popular as cappuccino in a café in New York City. For almost a decade, the print edition of Literal Latté was widely read and critically acclaimed throughout New York City, from our first issue in 1994 to our last print issue in 2003. These days, Literal Latté is entirely online, and we bring our writers to the world. Although we were among the first literary journals to have an online presence (in 1997! ), we completely redesigned our site in 2008. In time, we plan to include the entirety of our massive archive of top-shelf prose, poetry and art on the site. Could you use a fresh set of professional eyes on your poetry manuscript? Have you been drafting and revising, publishing individual poems, but still haven’t placed your book with a press? There seems to be some secret to winning the contest or impressing during an open reading period that’s impossible to crack. Oftentimes poets believe they will receive intensive, line-by-line feedback on their books from graduate school mentors or in workshops, only to be left wanting. If you crave elusive, thorough, and personalized feedback on your book from an accomplished and empathetic reader who will expedite your book’s publication, my manuscript critique service is for you. “Sandy Marchetti edited two of my manuscripts, after which one was picked up by a publisher I really admired and I know that a large part of that success was due to her excellent eye. Receiving a critique from Sandy was like having the ability to really understand my work from a level not accessible by my everyday psyche--she revealed to me what I knew all along about my own work by breaking into the spaces I was too close to see. I highly recommend her services!” –Shannon Hardwick Green, author of Francine in the Garden, THRUSH Press 2015. “I recently asked Sandra to look at one of my manuscripts before submitting it to a chapbook contest. At the time, I was uncertain which poems to include in the submission, but Sandra generously said not to worry about finalizing my choices before sending her the draft--to, instead, send her all of the poems I was considering. The thoughtful commentary I later received from her would prove instrumental in deciding which poems were strongest and to include for submission. Sandra displayed her keen editorial insights in the personalized comments she sent me--insight no doubt garnered from her experience as a poet and editor--as well as a delightful versatility…I would recommend Sandra to any writer in need of a second pair of eyes, knowing that he or she will be in good hands.” –Noh Anothai, winner of Lunch Ticket’s 2014 Gabo Prize for Translation. So how does the process work? First, I will read through your collection and look for big picture concerns. I will write a detailed 1500+ word letter to you regarding the manuscript's coherence, motifs, ordering principles, etc. If you send along any questions, I answer those. I look to magnify your book’s strengths and am enthusiastic in enhancing your vision for it. Then, I comment individually on every poem in the manuscript, making suggestions regarding diction, line breaks, and syntax that will help you to look at the book from a new perspective. In this stage, I will indicate if some poems seem stronger than others, where another poem may be needed, or how sections are working. I familiarize myself with your diction and style and suggest improvements to strengthen your unique capabilities with language. My fees are hourly. Critiquing a full-length book takes me about 6-8 hours, assuming the book is between 50-80 pages. I usually charge about $200 for the service. Chapbooks cost about half as much because they take half the time. My standard fee for 15-35 page chapbook is around $100. I work with clients both electronically, via email and PayPal, or the old fashioned way, via checks and marked up manuscripts in the mail. My turnaround time is between 10 days and two weeks. I would be honored to deeply read your poems and propel them to publication with a fine press. In addition to manuscript critiques, I also offer literary publication coaching and substantive editing for individual poem publication. I am filling slots now, so contact me at sandrapoetry@gmail.com or https://www.facebook.com/sandywritingservices to get started! Sandra Marchetti is the author of Confluence, a debut full-length collection of poetry forthcoming from Sundress Publications. Eating Dog Press also published an illustrated edition of her essays and poetry, A Detail in the Landscape, and her first volume, The Canopy, won Midwest Writing Center's Mississippi Valley Chapbook Contest. Sandy won Second Prize in Prick of the Spindle's 2014 Poetry Open; she was a finalist for Phoebe’s Greg Grummer Poetry Contest and Gulf Coast’s Poetry Prize. Sandy’s work is anthologized in Prairie Gold: An Anthology of the American Heartland, Parts of the Whole: Poems of the Body, New Poems from the Midwest and elsewhere. Her poems and prose also appear in The Journal, Subtropics, The Hollins Critic, Sugar House Review, Mid-American Review, Thrush Poetry Journal, Green Mountains Review, South Dakota Review, Phoebe, Word Riot, Southwest Review, and other fine magazines. Sandy currently lives in Chicago with her husband, teaches writing at Elmhurst College, and is an Associate Poetry Editor at Stirring: A Literary Collection.